A year's subscription to our daily bible reading notes for young people. 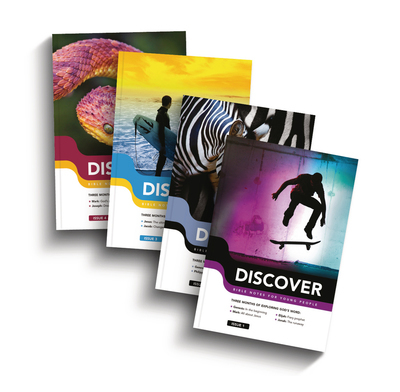 Discover aims to build young lives firmly on the gospel and a knowledge of the Bible. It's jammed full of straightforward, no-nonsense explanation of God's Word. Bursting with puzzles, questions and top teaching to help the reader get stuck into the Bible. These notes have engaged my 11 year old son perhaps more than anything else we've used before. Great resource. I use this with my 12 and 10 year olds. We enjoy the good mix of reading, explanation and puzzles which keep them interested and engaged. It takes us around 15 mins each day which is just the right time to reinforce the importance of daily Bible reading among the other activities. My 9 year old daughter went off to a camp at Easter and invited two friends who have relatively little Christian bible input. I was so excited, and thrilled when they had so much fun. I was even more thrilled though when A offered to get her friend bible reading notes and she agreed to take them! Both 9/10 yr old girls and the other 11 year old boy are reading the bible every night and enjoying it. A great start for them all. Thank you! I'vee been looking for suitably engaging resources for my 13 & 15 year old girls for their regular bible study for years. Now at long last, after trying several others supposedly appropriate ones, picked this up on impulse in our local Christian bookshop, hurray! At last, found something that they can do on their own as concepts are conveyed simply but without being patronising - a real turn off for teens. It challenges their preconceptions and clarifies the text. It is presented relevantly in a fun way, whilst providing food for thought. Another good thing is that it is not too long, so ok to do last thing at night which is the only time we can find to do it! Thank you! Having enjoyed doing XTB with my son, now that he is 12, I felt he needed something slightly different. I tried the three week 'discover' starter issue, and through that, my son became a Christian. It wasn't forced or false, but genuine repentance and faith. Discover is very clear and direct, and caused him to ask lots of searching questions which led him to put his trust in Jesus as his Saviour. I shall be eternally grateful to the godly people at the Good Book Company who paved the way for what every Christian parent wants for their child : salvation through Jesus. I have now subscribed to the full edition of discover, in the prayer that my son will now grow in godliness and in deeper love for Jesus, as he works out his salvation. Like one of the previous reviewers my 11yr old son had been using different notes, which he found heavy going as they focused more on a longer passage and less explanation/ elucidation. He loves the shorter yet better explained notes and the puzzles engage him much better. If you are looking for a guide, he is a very enthusiatic reader, maybe reading slightly above his age norm.